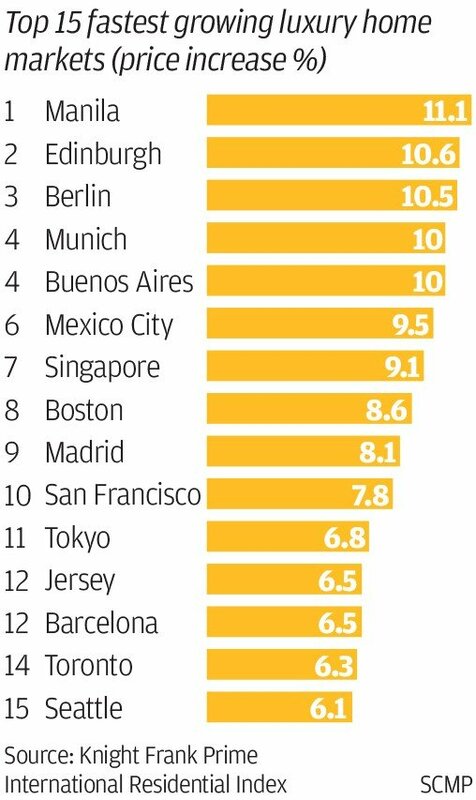 Tokyo came in 11th, rising by 6.8 per cent; Paris, 19th, up by 5.3 per cent, and London, 91st, down by 4.4 per cent. Ten US cities made the top 100 list. Boston came in first among US cities, in 8th place, with an 8.6 per cent gain, and San Francisco ranked 10th, with a 7.8 per cent rise. The annual report aims to signal market opportunities to the consultancy's clients. “While Manila’s 11 per cent growth is far from the norm for the city, it confirms the theory that outliers are disappearing, and we are moving to a period of slower price growth. Within Asia-Pacific, a slowdown from a 4.9 per cent average growth rate in 2017 to 2.7 per cent in 2018 illustrates this trend,” said Nicholas Holt, Knight Frank Asia-Pacific head of research. In 2018, Manila’s luxury homes market drew 6.5 billion pesos (US$125.1 million) in investments, down 35 per cent from 10 billion pesos in 2017. In late January, a new luxury project with 180 prime residential units broke ground, adding supply to the market. Makati, the premier business district, and neighbouring Bonifacio Global City, corner Manila's luxury market. The Estate Makati, a joint project of firms owned by the Philippines' two wealthiest families, is expected to command higher prices. On average, the 100 luxury residential markets tracked by Knight Frank's index rose 1.3 per cent in 2018, down from 2.1 per cent in 2017 and the index's lowest rate of annual growth since 2012. “In particular, the government's clear strategy and plans for infrastructure development in the city has given business confidence a huge boost,” said Desmond Sim, head of CBRE research, Southeast Asia. “Anecdotal data indicates that most of these buyers committed to their properties at developers' road shows abroad. This new source of demand is expected to shore up prices of condominiums across the mid to high-end market segments,” Sim said.